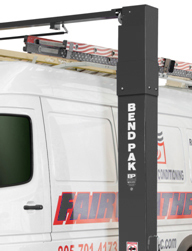 The safe and rugged BendPak XPR-10S-168 two-post lift features extended height columns for added overhead clearance and an adjustable top beam to accommodate wide or narrow installation set-ups. The adjustable width design allows you to choose the best setting for your specific space or vehicle lifting requirements. The popular XPR-10S-168 auto lift uses the same great features of the standard XPR-10 model, but adds 2 foot height extensions on the columns thus increasing your vehicle service capabilities. The extra column height allows you to raise taller trucks with ladder racks and sprinter vans without worrying about tripping the shut-off bar before maximum lifting height is reached. Now you'll be able to get any vehicle all the way up so you can stand up free and clear underneath. 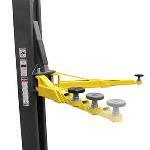 The BendPak XPR-10S-168 Lift is ALI and ETL Certified. Our newest line of XPR-Series 2-Post lifts offers a wide selection of durable, safe and reliable systems for virtually every lifting application. Powerful and secure, BendPak’s XPR-10S-168 in particular has an incredibly rapid lift speed and a robust menu of features to increase efficiency and productivity, but with fewer serviceable parts and reduced necessary maintenance. The results are lower operating expenses and higher productivity. If you’re looking to make more money in less time than ever before, you’ll find that the new XPR-10S-168 lift is the perfect addition to your shop. Tall, narrow fleet vans have been the rage in Europe for more than a decade and are just now becoming popular in the United States. Universally referred to as “Sprinters,” these aerodynamic and fuel-efficient vehicles captured 3.5% of the full-size van market in 2005. Four short years later, that number rose to almost 18%. Now, some estimates suggest it will reach as high as 23% before the end of the decade. Companies like FedEx, DHL and Microsoft already employ Sprinters for delivery and transportation services. Don’t they sound like the kinds of clients you’d like to have? The extra height that the XPR10S-168 lift offers allows you to raise taller sprinter vans, service vans and even pick up trucks with caps and ladder racks without having to worry about tripping the shut-off bar up above before you've reached the maximum lift height. These sprinter vans have become extremely popular in the last few years and will not be able to be raised completely on a standard height lift. If you want your technician to be able to service these vehicles while standing up underneath, you'll need one of these axtra tall models. That's why BendPak's auto lifts are ahead of the competition. They're always innovating and offering features that the other guys don't.  They offer probably the widest variety of lifts on the market. The XPR-10S-168 is a premium direct drive, closed top model with a symmetric configuration and a 10,000 lb. capacity. The XPR Series two post auto lift is engineered for professional auto shops as well as the home hobbyist. It is comprised of features to make is safer, more reliable and more durable than the competition. They also made it more efficient, to increase your shop's productivity and reduce expenses and maintenance as you'll see if you continue scrolling down below. If you want a premium automobile lift at a reasonable price, the XPR two post auto lifts are for you. The XPR series shows why BendPak auto lifts are on top. They feature the highest quality components along with meeting the highest safety standards that go above and beyong ALI and OSHA standards. No other manufacturer offers so much, for such a reasonable price. A wide array of optional accessories to make your lifting experience safer and easier are available. Of course, the standard features included with each model far surpass most of the competition. Low profile frame screw pads - allow you to get under most low profile sports cars that might be difficult to reach with most hoists. Can infinitely adjust up to 2.5 inches, for the ultimate versatility. Maintenance free load bearings - Some manufacturers use roller bearings that must be lubricated on a regular basis, and also cause significantly more wear on the inside of the column. The XPR lifts use utilize a innovative UHMW (ultra high molecular weight polythylene) load bearings that not only are guaranteed to last the life of the lift, but also will never need lubrication.